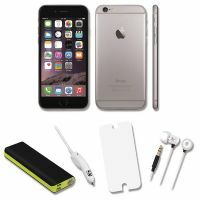 This Certified Pre-Owned (CPO) Apple iPhone 6 features a 4.7 inch retina display with a screen resolution of 750 x 1334 pixels. The phone also features an 8 mega pixel camera, 1080p HD video recording and is Apple Watch compatible. Using iOS 8, this phone has 16GB storage and comes in Grey. Also included in this great bundle deal is a Reviva 12000mah power bank, a Reviva Lightning 2 amp in-car charger, a set of Reviva in-ear headphones with mic and a clear screen protector.